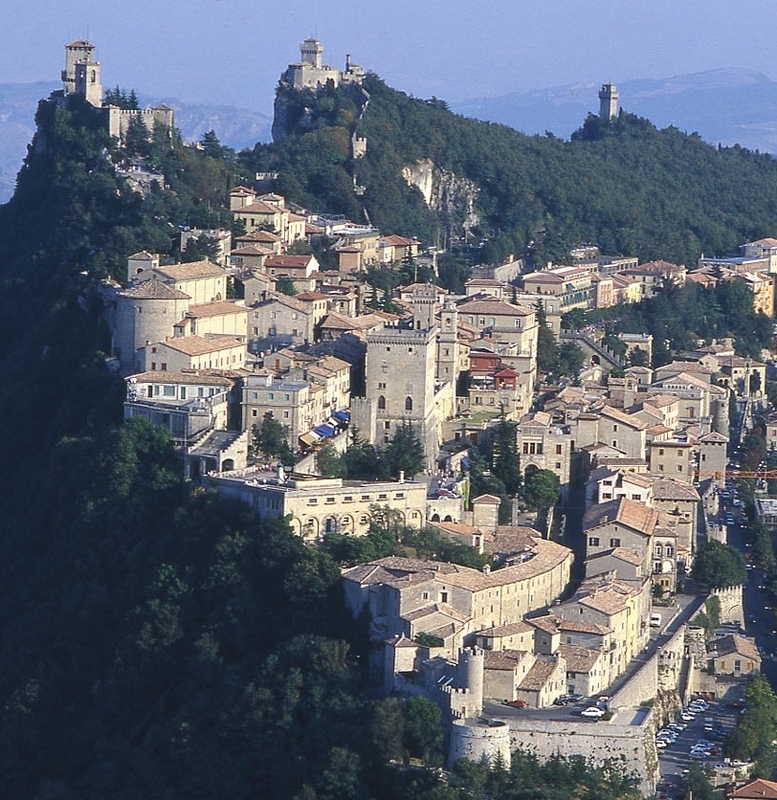 Perched on the top of a rock at 657m of elevation, the 61-sq-km Republic of San Marino is Europe’s third smallest state after the Vatican and Monaco. It was a day trip destination in 1991, on my overland trip to Europe with my family. About 2.1 million visitors per year make the very steep climb to the historic centre which is largely taken over by tourism. Hundreds of souvenir stalls line the not-unattractive streets selling everything, from Samurai swords to San Marino stamps and locally minted coins. There are also restaurants to feed the visiting hordes of bus loads full of tourists. However, if you catch it at a quiet time (i.e. during the week, preferably in winter) the old town is pleasant enough and the views are spectacular. 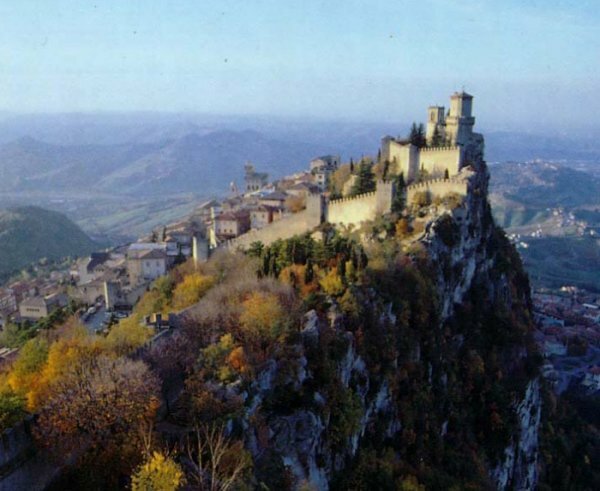 Several legends describe the founding of San Marino, including one about a stonecutter who was given the land on top of Monte Titano, by a rich Roman woman whose son he had cured. In reality, throughout history, it’s pretty much been left to its own fate. In recent years, during the Second World War, it remained neutral and played host to 100, 000 refugees until 1944, when the Allies marched into town. As all this took place during my visit in 1991 and just for a day, I can hardly remember San Marino. The only thing I do remember is the impressive location of this small republic as it’s literally a country on top of a cliff. As for photos, it was impossible for me to find any in my parents’ albums. So I downloaded some from the internet for you to get an idea. San Marino doesn’t even exist as a country in some books. It’s too small even to be mentioned. So go there and enjoy this miniature country. PS. THIS POST IS DEDICATED TO MY MOTHER. SHE ALSO HAD THE TRAVEL BUG IN HER AND THANK GOD, WE MANAGED TO TRAVEL TOGETHER QUITE A LOT BEFORE SHE PASSED AWAY.